Just over a week ago, last Saturday to be exact, I wrote how it felt as if the Mets were quickly approaching rock bottom. I was exaggerating of course, but the Mets had just been swept during a six-game homestand and the offense was downright pathetic, scoring just 11 runs total. That being said, I think this week was a new low point this season. That franchise-best 11-1 start? It vanished like a mediocre magic trick. The Mets are now just a single game above .500 and have dropped to fourth in the NL East, behind Atlanta, Philadelphia and Washington. 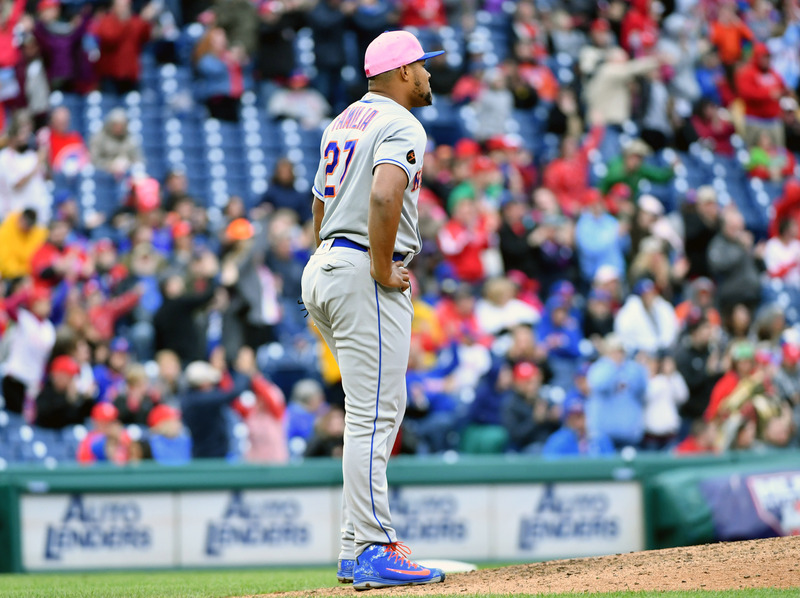 Coming off the embarrassment of a winless homestand, it seemed like the Mets were gifted a cupcake to get them back on track in the form of a league-worst Cincinnati Reds team. Well, so much for that. The Mets dropped two of three to the Reds, falling to a putrid 1-8 in their last nine games. Unfortunately, that’s not even the worst of it though. The Mets, a Major League Baseball team I may add, batted out of order in the first inning. It’s not like they had made a couple of complicated double-switches or used a bunch of pinch hitters. Nope, it was far worse. An error so unthinkable in today’s game that the only team that could pull it off did, in fact, pull it off. To make matters worse, it looked like the Mets were primed to drop the series opener to the Phillies on Friday night too, but a pair of home runs off the bats of Michael Conforto and Devin Mesoraco in the ninth allowed them to steal a game they really had no business winning. It seemed like the team finally had some momentum for the first time in two weeks, especially with Noah Syndergaard and Jacob deGrom set to start the next two days, but Saturday’s game was postponed and gone was the momentum. After a one-hour rain delay Sunday, the Mets were able to load the bases in the first against Phillies ace Aaron Nola but they ultimately couldn’t capitalize. With an off-day Monday, the Mets elected to push Syndergaard back since he had warmed up prior to the postponement Saturday, which meant deGrom was still going to make his return on Sunday. The fanbase was relieved to have the staff ace back on the mound, but the celebration lasted all of one batter. deGrom began the bottom of the first by walking the bases loaded, but somehow escaped without allowing a hit or run. It took him 45 pitches to do so though, and Mickey Callaway sent Luis Guillorme up to bat for the pitcher in the top half of the second. It was undoubtedly the correct decision to take deGrom out, but using Guillorme as the pinch hitter was one of a few questionable decisions made by Callaway. Guillorme collected a base hit in his first major league plate appearance but was pulled out of the game in the bottom half of the inning in favor of Robert Gsellman. Burning Guillorme in the second inning was hard to comprehend, as he could’ve come on later in the game as a defensive replacement for Wilmer Flores, or as a pinch hitter more likely to succeed than Jose Reyes. Losing Guillorme in the second inning wasn’t even the first questionable move made on Sunday. That came before the game even started when the starting lineups were announced and Dom Smith wasn’t in it. See, the Mets placed Jay Bruce on the paternity list Friday and used the open roster spot to call up Smith, who only plays first base. Any logical person may have thought that the team planned to give Smith a start or two at first, but he wasn’t in the lineup Friday or Saturday. Spoiler alert: he wasn’t in the lineup Sunday either. It was an odd move when the transaction was announced, but it became completely nonsensical once Smith struck out in his only at-bat of the series. When the organization called up Smith, they bypassed utility-man Phil Evans, who’s already on the 40-man and can play virtually every position if needed. There’s no doubt he would’ve allowed for more lineup flexibility during the late innings Friday and Sunday had he been in Philadelphia instead of Smith. Alas, it probably didn’t cost the Mets the game Sunday, but it didn’t exactly help them in any way, either. After a Yoenis Cespedes solo shot put the Metropolitans ahead 1-0 in the sixth, Callaway sent Paul Sewald out for another inning. Sewald allowed a double that was almost a home run to Carlos Santana to lead off the inning, followed by a walk to Scott Kingery to put men on first and second with only one out. A Jorge Alfaro strikeout was out number two and Callaway had Jerry Blevins ready to face the pinch hitter, Nick Williams. Except he chose to let Sewald work out of the jam and well, the rest is history. Williams went deep to give the Phils a 3-1 advantage they wouldn’t relent. Choosing to stick with Sewald over Blevins was another debatable decision in a game seemingly full of them. The level of mediocrity we’ve seen the past two weeks is much more reminiscent of the Mets we know and love. The 11-1 start, like most things in life, felt too good to be true. Baseball has its ebbs and flows, and the Mets are likely in the midst of their worst two-week stretch of the season. At least, let’s hope this is as bad as it gets because honestly, what’s more embarrassing than batting out of order in the first inning? As all Met fans can attest, it’d be better if we never found out.